Want to learn more about music production? Or just looking for a short introduction video? 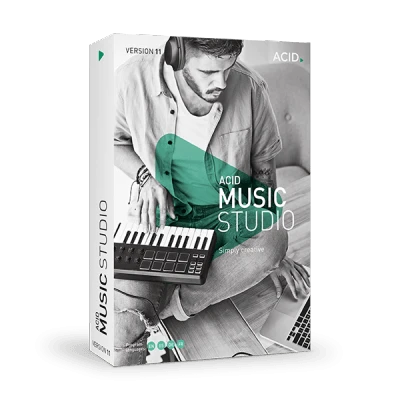 Find out all you need to know about making music with ACID Music Studio 11 here. Welcome to ACID Music Studio. This video will show you how to get the most out of ACID Music Studio. Find out how to produce your own tracks using ACID sound loops, cut loops with the Chopper and play software instruments. The Chopper is a creative tool which you can use to make your own loops and remixes. This video explains how you can cut any kind of audio material into short loops and then insert these into your project. Every song has a specific playback speed (tempo) and pitch, which can be modified independently of each other. A wide range of tempo and pitch settings can also be freely modified within the song itself. In this video, we explain how it works. ACID comes with lots of different soft synths which can be played using a MIDI keyboard or controlled by means of a MIDI file. Learn how to load these music instruments, modify their audio settings, and play and record them. You can edit your recording and other MIDI files directly in the track. Simply use the pen tool to draw in new MIDI notes. In this video we'll show you all you need to know about MIDI editing. When you're composing a song, you aren't always quite sure at the beginning what the final structure will look like. In this video we'll show you how to create different sections of a song and then combine them into the finished product.